When I decide to get a tattoo, it’s always something that has a great deal of meaning to me. I have three now, and I love all of them. I make myself wait and think about what I want to get, where I want it, etc, because it is…well, permanent. 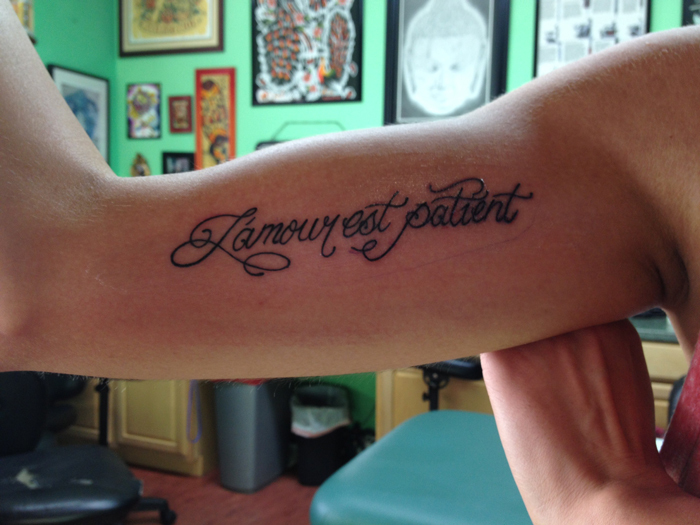 With this one, I knew I wanted to get “L’amour est patient” which is “Love is patient” in French. I wanted it because, well, patience is not my strong suit. When I want something to happen, I want it now. Of course, in true Briana fashion, I decided I was ready to get the tattoo and went about an hour later to get it. Baby steps…but I’m very happy with it. That must have hurt getting it on the inside of your arm- I like it, it’s pretty.